Annual universal survey of project, program and portfolio managers representing the important trends in project management. Designed “by faculty, for faculty,” the study catalogs and teaching resources can be used to initiate a basic course or integrate project management topics and concepts into existing courses. The Global Accreditation Center for Project Management Education Programs (GAC) is a self-regulating educational certified body with policies, procedures, and standards for accrediting project management and related programs at the bachelor’s, master’s and doctoral degree levels. Following fresh academic research with the aim to progress knowledge in project, program and portfolio management. We provide knowledgeable and research-oriented opportunities at various conferences and regional workshops throughout the year – by motivating interdisciplinary association among practitioners and scholars and by broadcasting new knowledge in project management. 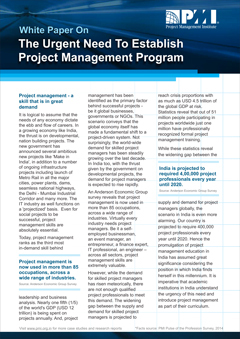 PMI aims to progress in project management curricula for both undergraduate and graduate programs. This competition aspires to produce knowledgeable cases and instructors’ manuals related to managing projects for use in the ongoing enhancement of project management courses in business, engineering, and IT schools. Requests for case proposals releases between 2 January - 1 May. PMI encourages and supports intellectuals who create and distribute knowledge through new investigation and studies in project management. We motivate the academic community to submit their work to Project Management Journal as well as PMI conferences and those of allied academic organizations. Come and join the academic network of scholars, faculty and project professionals interested in the construction and distribution of knowledge in project management and get the latest information in the field. This affair is full of opportunities for students interested in project management. It provides a live important presentation on Next Gen Leadership by Seth Mattison, learning and collab sessions, and networking with your peers. The Survey Links Program was designed as a way to promote project management research in an accessible manner.